From the parking lot, the main building in front of you is the Church. It contains entrances to (A) the chapel, (B) the main church, (C) the parish office, and (D) the elevator (for handicapped access to the main church). The Education Building is to the left of the Church and the Parish House is just behind it -- both are accessible via the stone stairs (E) just to the left of the Church. The Churchyard and graves are accessible via the path just to the right of the Church building. The Rectory is located up the hill to the left of the Education Building. In keeping with the architecture of the Tuxedo Club and many of the original homes by Bruce Price, the church was designed in the Shingle Style in 1887 by the architect William Appleton Potter. Native stone was used for the undercroft, and the building was skillfully perched astride a large segment of rock. Inside the main nave, the five cross-tie roof trusses, which form a crucifix, lead you to the dominant pointed arch that frames the altar. The soaring trusses shape the nave and with the low roof transepts, create a warm and sheltering architecture, typical of the Shingle Style. The natural oak wood finishes of the plank floors, wainscoting, pews and ceilings contrast with the white plaster walls that provide a neutral background to the memorial plaques and the splendid colors and pictorial representations of the art glass. The stained glass windows, which fill every opening and filter all of the light entering the nave, are some of the finest from the studios of Louis Comfort Tiffany, Charles Lamb, John La Farge, Maitland Armstrong and Henry Wynd Young. The sanctuary (area around the altar) was completely redesigned in 1922 by Bertram Grosvenor Goodie, architect of St. Thomas Fifth Avenue in New York City. In 1954, the St. Mark's altar was installed at the foot of the left aisle. In 1971, a new organ was installed with nearly 2,000 pipes, ranging from the size of a lead pencil to 16' in length. The seating capacity of the nave is approximately 300. Elevator access to the nave is available directly from the parking lot. Restrooms are located in the undercroft of the church or the adjoining Education Building (they are not yet handicapped accessible). Constructed in the stone undercroft of the church in 1941, the Chapel of the Holy Spirit was designed by George de Ris. Various design elements, including the marble columns, altar, stained glass fragments and iron doors came from Mortemar, the home of Richard and Eleanor Jay Mortimer. With a seating capacity of approximately 35, the chapel is a warm, intimate place to worship. In addition to our 8 am service on Sunday and our 10 am Wednesday service, the chapel is open 24 hours a day, seven days a week to serve as a peaceful sanctuary for anyone in need of quiet reflection or prayer. In 2015, due to the generosity of a parish family in the form of a challenge grant, the chapel underwent a renovation which included all new lighting, heating and air conditioning. The chapel connects to the vestry room on the ground floor of the church. Designed by James Brown Lord, the parish house was completed in 1901. A hallway connects the nave to a large cheerful meeting room, now known as Bentley Hall. Here we have our weekly coffee hour as well as various other fellowship events throughout the year. There is a small attached kitchenette which we use for coffee hour. A few steps down, the Somarippa Room provides another great space for entertaining with a large fieldstone fireplace. On the ground floor beneath Bentley Hall, are the choir room, a full kitchen and Sunday School classroom. Built in 1962 and updated in 2011, the Education Building boasts two large, sunny classrooms which host our Community Preschool. It is attached to the Parish House. On Sundays, one of the classrooms is used for childcare during the 10 am service. In addition, there is an outdoor playground just outside the building. The great lawn just south of the Church is used for many community events like the popular Memorial Day commemoration and outdoor Christmas Market. An area east of the Church was opened in 1910 for burials and expanded northward in 1927 with the gift of additional land. In 1968, a columbarium, with a focal point of a large stone cross, was added. 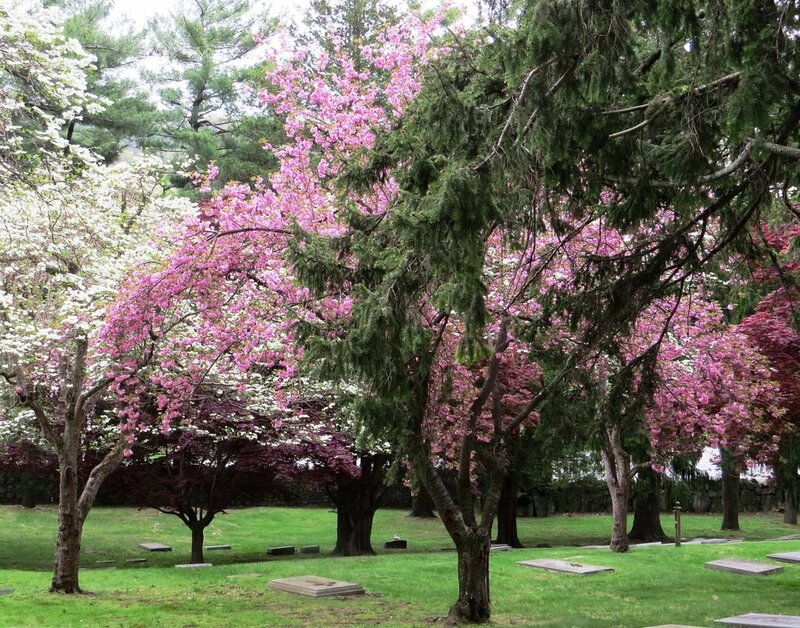 Beautiful trees grace the lawn and churchyard, including a huge magnolia and a stand of tamaracks. A permanent, living Christmas tree was planted and dedicated in 2017 to the memory of Val Napolitano, a longtime resident of the park. Designed by Richard Howland Hunt in 1895, the rectory was built in the same style as the Church with a native stone foundation and shingle style upper floors. The shingles were later covered with stucco. It serves as home for the rector and his family. Our rector also serves as priest-in-charge of the parish of St. John's in Arden, New York. It is a small country chapel located on the former Harriman estate, ten minutes to the north of St. Mary's. Three services are held each year at St. John's, on Thanksgiving Day, Christmas Eve and around Easter Sunday. These services are open to the public.